Niagara Bottling (“Niagara”) issued a voluntary recall of spring water produced at our two (2) Pennsylvania plants from June 10-18th, 2015 because the operator at one of our contracted springs failed to notify us that there was evidence of E. coli bacteria at the spring source. As of September 7, 2015 Niagara has found no E. coli contamination of any kind in our finished products or in the spring water that was delivered to our bottling facility. We are pleased to report that all samples received from consumers have tested absent for E.coli. Niagara continues to work closely with all applicable state and federal agencies related to this matter. Please direct any questions to our Consumer Affairs Department at (888) 943-4894. Last week, we issued a voluntary recall of spring water produced at our two (2) Pennsylvania plants from June 10-18th, 2015 because the operator at one of our contracted springs failed to notify us that there was evidence of E. coli bacteria at the spring source. Because there has been a great deal of misinformation reported and circulated over the last 24 hours, we felt it was necessary to issue this clarifying statement. Niagara Bottling performs extensive testing on both incoming spring water as well as finished products. We have confirmed there have been no issues or E. coli contamination of any kind detected in our finished products or in the spring water that was delivered to our bottling facility. Once we were informed of the potential presence of E. coli at the spring source, we immediately shut down our operations, disinfected our bottling lines and initiated a voluntary recall in an abundance of caution and in the interests of consumer safety. This recall only relates to spring water produced in our Pennsylvania manufacturing facilities from June 10-18th, 2015. It does not relate to any purified water or any spring water produced outside of Pennsylvania or outside the June 10-18th, 2015 timeframe. To determine whether your product is part of this recall, please visit the links below. If you don’t see your product on the list, it was completely unaffected by the recall and is completely safe to drink. Niagara has been family-owned and family run for over 50 years. Nothing is more important to us than consumer safety, which is why we issued this recall. If you have any additional concerns, please contact our Consumer Affairs Department at (888) 943-4894. Out of an abundance of caution and in the interests of maintaining the highest possible standards for product quality, Niagara is issuing a voluntary recall for Spring Water products produced from its Pennsylvania manufacturing facilities during the June 10th – June 18th time frame. 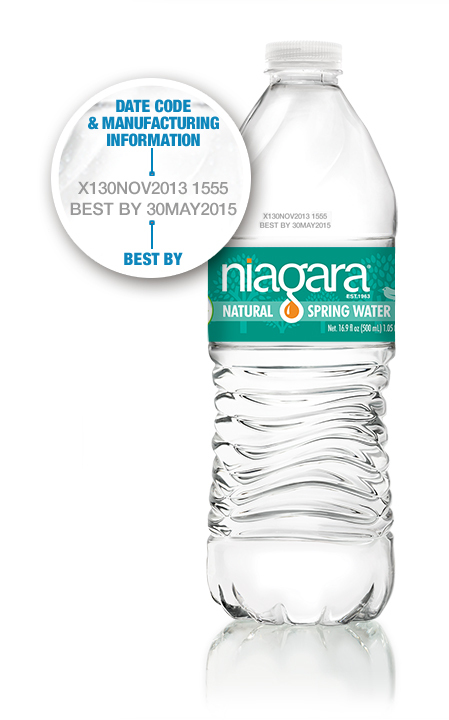 No other dates of Niagara® bottled water are affected by this recall. Niagara was notified that the spring source was potentially compromised. There have been no reports of any illness or injury related to the above mentioned products to date and finished product testing detected no contaminants or issues of any kind. This voluntary withdrawal is being implemented in cooperation with State and Federal Agencies. If you have questions about which products are affected, please contact us online or at (888) 943-4894. Additional information can be found in the downloads below. Our voluntary recall only affects SPRING WATER (Not Purified Water) manufactured at our Hamburg, PA and Allentown, PA facilities between June 10 – June 18th. F# indicates the Hamburg plant and line number A# indicates the Allentown plant and line number See below for Best By dates specific to Wegmans brand. Refer to this bottle image for the location of the Date Code & Best By dates on the bottle. NOTE: These Best By Dates apply ONLY to Wegmans branded product.